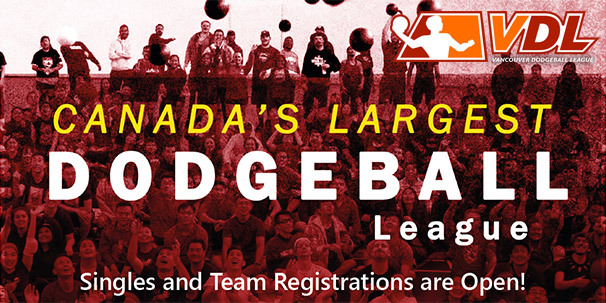 Vancouver’s first, largest and only non-profit player driven dodgeball league is proud to announce details for it’s 28th season! For the Spring season, you can expect a community of over 200 teams and 1,500+ players, high quality play at all skill levels, epic playoff matches and of course, loads of fun! Play dodgeball, stay active, meet new friends, be part of a great community, and get ready for good times! Reserve your spot in advance before the season sells out. Don’t have a team or want to meet new people? Sign up as a single player or as a pair and VDL will do our best to match you up with teammates. It’s a great way to meet new people and make friends. Plus the legendary VDL Pub Night! *Please note, teams can expect to play in both the 7:00pm slot and the 8:30pm slot throughout the season. A team’s game time slot and gym location will vary on any given week depending on their current tier and gym availability. We will make it as fair as possible, but cannot accommodate requests for one specific time slot and location throughout the season. Note: Playoff dates subject to change. Learn how to register, create a player profile and sign your waiver HERE. All players will create a player profile and sign the waiver form before they participate in the league. Sign your Waiver's here!